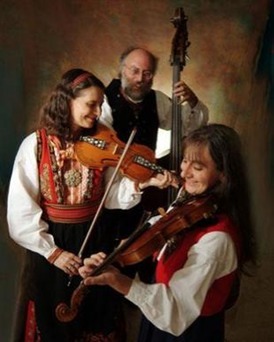 o, what happens when you put together one of the finest American-born Swedish fiddlers with one of the finest American-born Norwegian fiddlers and add a guy who has traveled the northern countries of the world playing, well, yes, Scandinavian music with a multi-national band? You get music that is anything but ordinary. Strings. Vibrating strings. Lots of them. One fiddle, one hardingfele, and one contrabass. Rich deep fundamental notes and ethereal haunting overtones. The scales twist your ears and the rhythm has a life of its own. From the tale of its origin to the names of the players who passed it along, each tune speaks of a land and a tradition. None of this explains the raw life that fills the room when Andrea, Loretta and Charlie play. Perhaps it is the decades of experience and passion that each musician brings. Or maybe it is that they are playing music that fills their souls to overflowing. Andrea, Loretta and Charlie’s CD, Hambo in the Snow, was nominated in the Best Traditional World Music Album category for the 49th Annual GRAMMY® Awards. It was an honor to be nominated and they had a lot of fun at the Grammys!